Autumns’s here…shorts away and warm coats on. Now is the moment when you can swish through large piles of multi-coloured leaves and make excuses for drinking lots of hot chocolate in comfortable cafes. It’s also a great time to go for a walk or a wander and take in some sights. A mural perhaps? Yes, I’m encouraging the visiting again while the weather is still fair enough for you to want to leave the house. 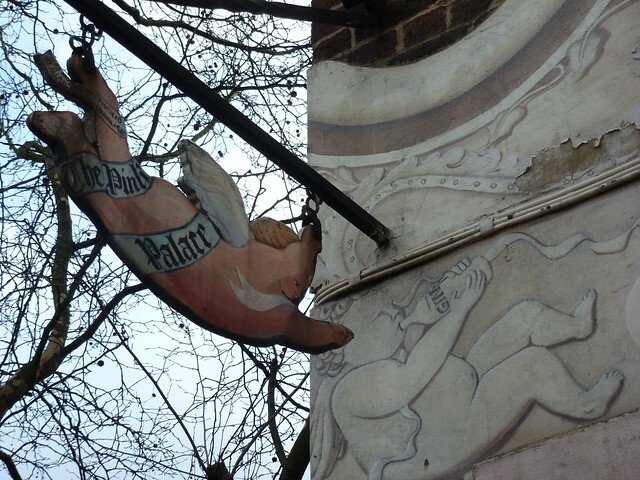 This time we are off to sunny Deptford to see the Pink Palace Mural. It’s a funny piece – a fake facade on a 1930s housing estate for the Tenants’ association building! 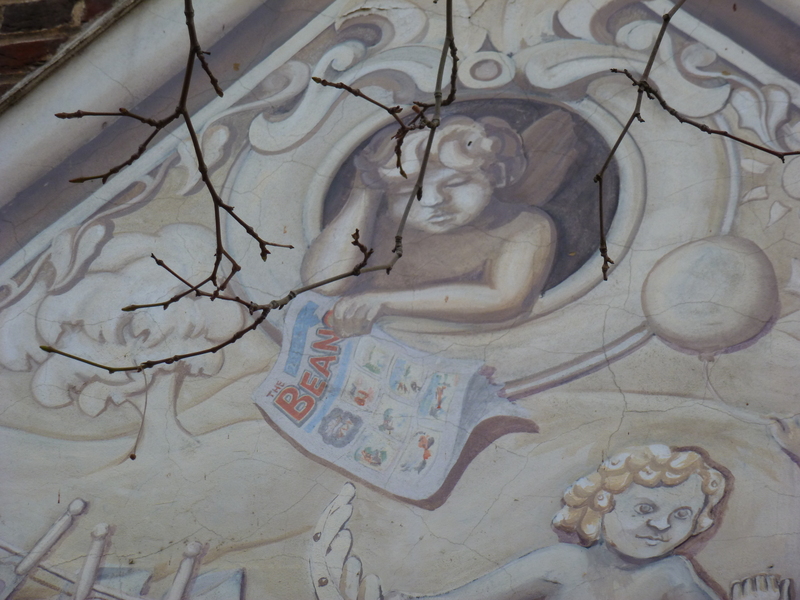 If you take a step closer and have a look at the detail, the piece is littered with cupids or ‘putti’ – so it references a classical type of trompe l’oeil. 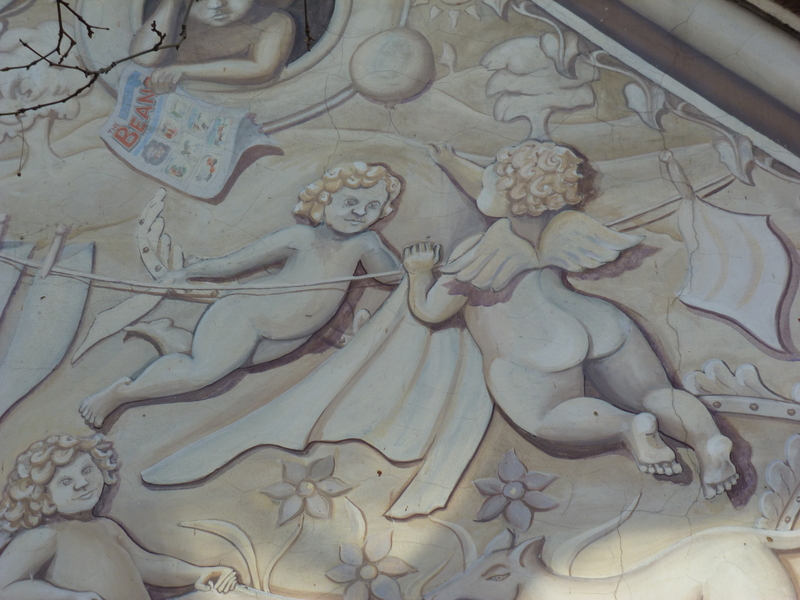 However, the figures are all doing modern type of activity – well modern for 1983 – the date of the mural’s creation! 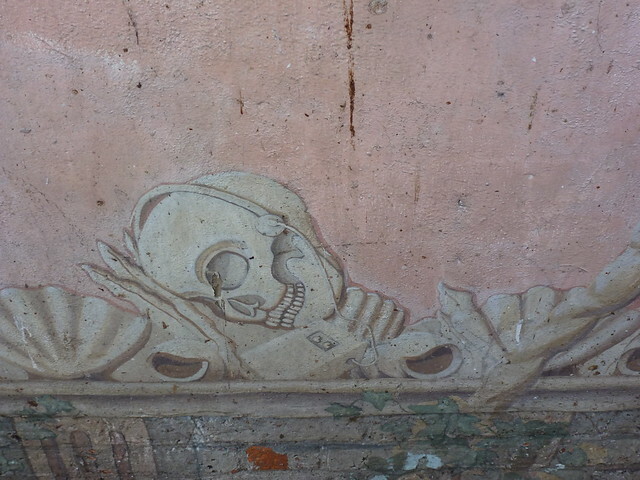 One detail I particularly like is at the the bottom of the mural; it is a skull wearing a walkman amongst a collection of shells and bones. The shell is a motif often used in classical art and architecture. 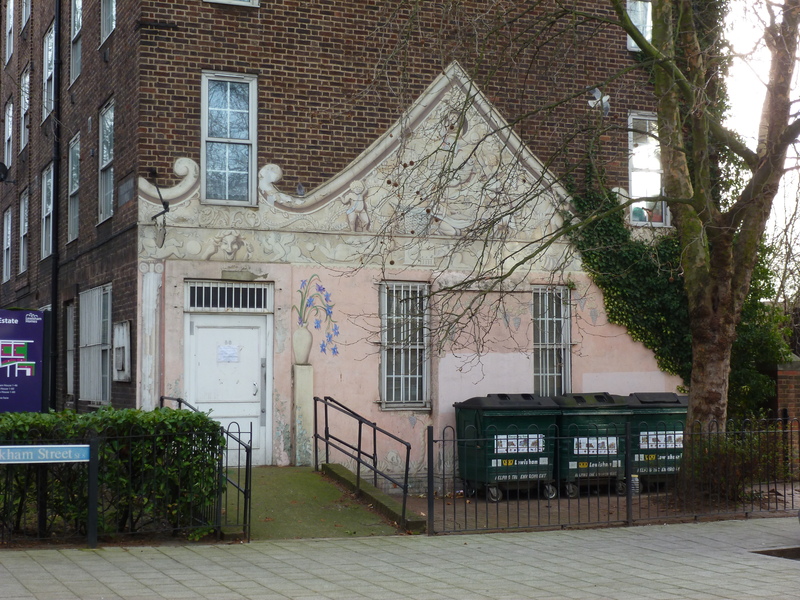 Something else I really like about this piece is the wooden sign for the Tenants’ Association which is designed as a putti, pointing to the mural. It’s amazing it has survived in such good condition suggesting that it was made pretty well in the first place. So I’m going to repeat myself by suggesting to take the time to have a look at this piece. Plenty of other things to do in Deptford too! More information about the mural can be found here. This entry was posted in London Mural Preservation Society, Mural of the Month and tagged deptford, London, Mural. Bookmark the permalink.